The contest is over. And the winners, chosen randomly, are Anita E and Ronald Oliver! Congratulations! Please email your mailing address to lhlerman@gmail.com before December 10 to claim your prize. 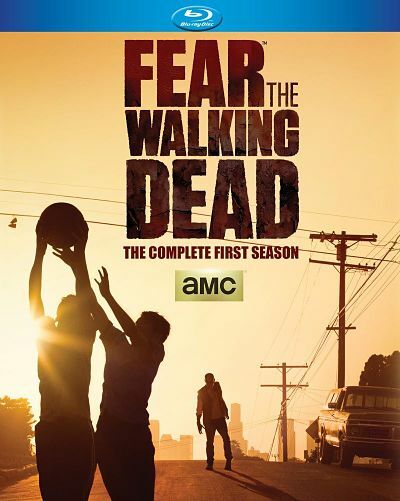 The first season of AMC’s hot-hot-hot new drama-horror zombie series, Fear The Walking Dead: The Complete First Season, a spin-off of AMC’s even hotter The Walking Dead, arrives on Blu-ray and DVD on December 1 and Disc Dish has two Blu-ray editions to give away to a pair of readers! Kim Dickens and Cliff Curtis at the dawn of the zombie apocalypse in Fear the Walking Dead. Living in the same universe as The Walking Dead, Fear the Walking Dead is a gritty explores the onset of the undead apocalypse through the lens of a fractured family. Set in Los Angeles, a city where people come to escape, shield secrets, and bury their pasts, a mysterious outbreak threatens to disrupt what little stability high school guidance counselor Madison Clark (Kim Dickens, Gone Girl) and English teacher Travis Manawa (Cliff Curtis, Missing) have managed to assemble. The everyday pressure of blending two families while dealing with resentful, escapist, and strung out children takes a back seat when society begins to break down. A forced evolution, a necessary survival of the fittest takes hold, and the dysfunctional family must either reinvent themselves or embrace their darker histories. Link to this page from your Facebook profile, Twitter account, Digg, Reddit.com, blog or wherever you hang out online and put a link to it in the comments on this page. You’ll get an extra entry for each link. (Sorry, but links added to the Disc Dish Facebook page don’t count.) You can use the icons below to share easily. Repeat steps 1 and 2 every day for even more chances to win. This giveaway runs through midnight, Tuesday, Dec. 1, and the winners will be at random and announced here on Dec. 2. So, make sure you check back to see if you won! NOTE: The contest is only open to readers who are 18 or older and in the U.S. Prizes cannot be shipped to P.O. boxes! facebook follower, twitter follower and subscribe to the email. I’m also an email subscriber to Disc Dish. Like on Facebook, following on Twitter, and subscribed to newsletter. I subscribe thru email newsletter. and I am subscribed to Disc Dish by email. and I’m subscribed to Disc Dish by email. and I am a Disc Dish email subscriber. I’m a Twitter follower & Facebook fan and an email subscriber. and I’m a Disc Dish email subscriber. and I am a Disc Dish subscriber by email. I’m a Twitter follower, Facebook fan & an email subscriber. I’m a Twitter follower, Facebook fan, and an email subscriber.